Last week, Alec Baldwin wearily acknowledged that our reality is growing so absurd that it’s beginning to rival fiction, including the dystopian kind. Now comedy writers face the daunting task of imagining more ludicrous and potentially harmful statements than those actually coming from the president’s mouth(pieces). 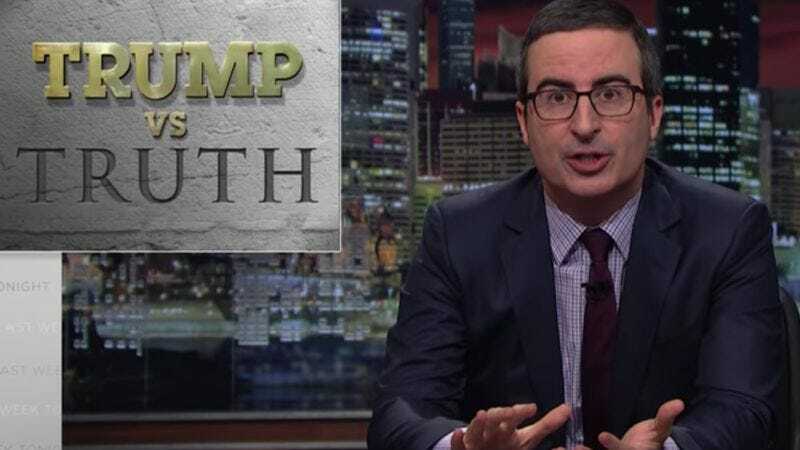 But John Oliver, fresh off a three-month vacation, is taking a different tack—he’s basically waving facts in front of Trump’s face in an effort to turn off that spigot of lies and misinformation. The Last Week Tonight host knows he won’t accomplish that with a thoughtful op-ed in a paper of record (which Breitbart certainly isn’t), or even an incisive segment on his talk show (to which Trump has never been invited). Instead, Oliver and his team have put together a series of commercials that will run during such daytime cable news shows as Morning Joe and Fox & Friends, the better to catch the president at his most alert. These commercials feature an older cowboy who knows the right way to cath, and isn’t afraid to talk about it, or the nuclear triad, or actual crime stats for large metropolitan areas. There’s also some stuff in there about basic human anatomy and decency, though that might have to be bumped up to an intermediate course.